The illegal trade in elephant tusks, fuelled by continuing demand for ivory, drives elephant poaching, where elephants in the wild are ruthlessly shot and their tusks hacked out. According to the WWF, a new report issued under the Convention on International Trade in Endangered Species of Wild Fauna and Flora (CITES) shows that illegal killing of elephants and illegal ivory trade continues to increase. The report highlights China and Thailand as the two most important raw ivory consuming countries in the world, and indicates that poaching trends can be correlated to increasing affluence in China and tourist arrivals in Thailand. To me it doesn't matter where the the demand's coming from -- I only wish those who are buying ivory trinkets, ivory jewellery, and other ornamentation carved from elephant tusks could be forced to spend a few hours close to dead elephants that've been shot by poachers and their faces butchered to remove the tusks. I took the pictures below in Zambia's Lower Zambezi National Park in July this year (2011) after safari guide Roddy Smith and I came across the shocking aftermath of an elephant poaching sortie. The two elephants were lying close together and must have been shot at the same time. A third dead elephant was found later, some distance away, with its tusks intact. It had managed to escape after being shot, only to die later from its wounds. 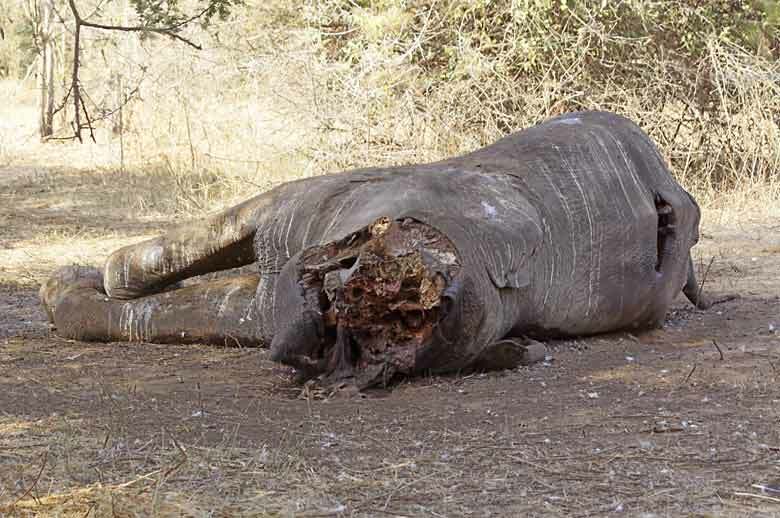 Dead elephant, its tusks hacked out and its hide streaked with vulture droppings, lies in rigor mortis under the African sun after being shot by poachers in Zambia's Lower Zambezi National Park. 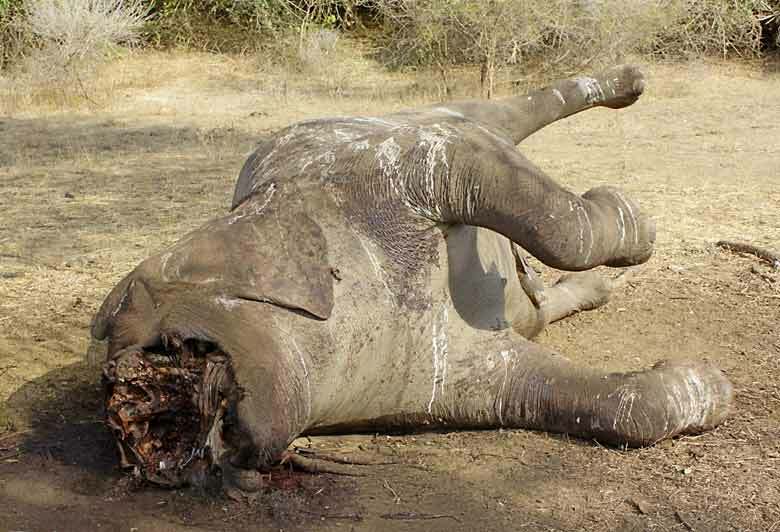 Another dead elephant, shot at the same time and its tusks also hacked off by the poachers, lies nearby. And for what? An ivory trinket or ivory carving (below). For those living in the West, it's easy to become smug and blame the illegal ivory trade on China, Thailand and other Asian countries. "In just two weeks, our survey found more than 660 items with a total advertising value of almost 650,000 across a variety of European websites. A shocking 98% of adverts failed to comply with website policies of providing evidence of legality," said Kelvin Alie, director of IFAW's prevention of Illegal Wildlife Trade Programme. "Europeans must realise that what they see as a pretty trinket for sale online is just one facet of an ongoing war against cruelty and for the protection of biodiversity. In Kenya, and across most African range states, elephants are ruthlessly slaughtered by poachers to fuel the illegal ivory trade," Alie continued. "Any trade in ivory provides a cover for and encourages elephant poaching and illegal trade in ivory. The war on illegal ivory trade and elephant poaching can only be won by removing elephant ivory not just from international trade, but entirely from the global marketplace, " he said. In 2007 eBay, under pressure from the International Fund for Animal Welfare, banned all international sales of elephant-ivory products. But sadly that's not the case in my own country, where Bid-or-buy.com, a South African online auction site, still lists hundreds of ivory items for sale. As those advocating a total ban on ivory sales point out, if ivory had no commercial value, there would be little incentive for anyone to kill elephants for their tusks and one of the major threats to their survival would disappear. So please don't buy ivory of any kind, and tell your friends and family not to buy ivory, especially when travelling in Thailand or South East Asia. For a contrary view, see: Do Ivory Sales Encourage Elephant Poaching? Or just the opposite?